A Churidar Dress material is owned by the family of conventional womens clothes outfits in India. Churidar Dress material is your grooming category that's longer or larger in size compared to standard outfits. The excess length of the fabric folds in the round shape and resembles heaps of bangles or churi resting around the foot, and so, the term churidar was derived. 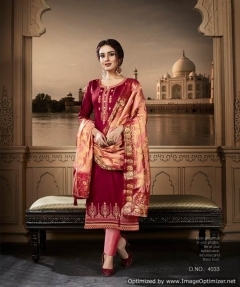 Churidar designs would be the Indian cultural part of clothes that graces all sorts of style and outfit. Apart from giving a stylish appearance, churidar Dress material pattern enables you to feel comfortable with you and appropriate for all events. "Churidar" is essentially a term out of Hindi dictionary. However, it enters into English from the 20th century. Girls in India used to utilize churidar layouts alongside the transparent overskirt and a bodice from the 19th century. But, churidar patterns originated in Pakistan in which it was a famed dress form. However, it was worn with the Pakistani Punjabis and North Indians too. Largely Indian and Pakistani girls like to wear hottest churidar design patterns nonetheless today. Churidar pattern is tremendously favorite among people around the world. Vast majority of the women select churidar pattern for floor wear specially. Therefore, you may compare churidar kameez using dupatta with salwar kameez and dupatta which are rather similar. The churidar apparel includes a narrow bottom and broad top. This classic apparel from the Indian tradition and civilization allows you to showcase the contours of your thighs. Anyway, it's not only for particular kinds of kameez but paired with many different top wear which you are able to carry off and preserve effortlessly. The excess length of this churidar apparel enables you to wear it comfortably and bend however you desire. Therefore, it's but one of the very comfortable outfits that's been designed.